YouTube is an online library for videos. YouTube is like a Mecca for videos. It is owned by Google and has millions of videos on its platform. All the viewers can get a variety of videos on the YouTube like Yoga, music, sports, movies etc. YouTube is one of the most surfed online portals. YouTube allows the users to upload the video and even share it. If you observe carefully, most of the YouTube videos are less than 15 minutes in length. Wonder why? The reason is that the limit set by YouTube. If you have an online reputation on YouTube and comply with YouTube terms, then the video length may be exempted. But are you that famous? The cap is on the file size as well, so you need to take good care of time and size as well. Undoubtedly, YouTube is a great experience and there are no two opinions about that. But, if YouTube weren’t there, where would people watch, upload and share videos? 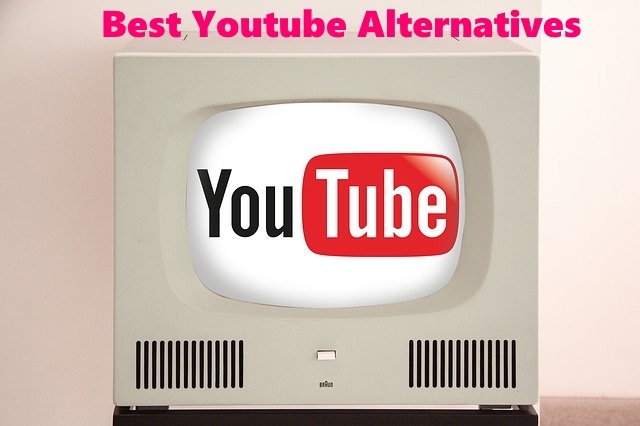 Umm, let’s explore some best alternatives to YouTube. Dailymotion is the next most popular platform for watching the videos after YouTube. 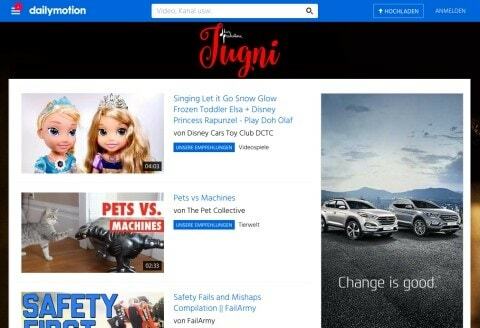 If you ever happened to land up on Dailymotion, then you would not agree more on the fact that it resembles YouTube, in terms of appearance. But a gentle reminder before using Dailymotion is that you need to have a flash player in place. If you wanted to upload a video of a length more than 15 minutes, then YouTube certainly is out of the picture. With the Dailymotion, you can stretch the length of the videos up to 60 minutes. But, you should check the file size upload limit (150MB). YouTube has higher (2GB) than that of Dailymotion. You can see some great quality videos on Dailymotion. If you were thinking of watching high-definition videos, then you would need a premium account. The signing-up with the normal account can also get you some provisions. The most-watched videos currently will feature on the landing page, so you can get a good deal of videos. If you already have some specific video in mind, like a new Batman movie trailer, then you can directly search and get yourself entertained. Remember, YouTube is bigger than Dailymotion, so the chances of the videos on the latter, being available on the former are quite higher. Dailymotion will serve you better with its features, and wouldn’t let you down. Vimeo… you guessed it right, the name is a combination of two words, video and me. Vimeo is a major contender to YoutTube, but a close observation will tell you they are different in many ways. 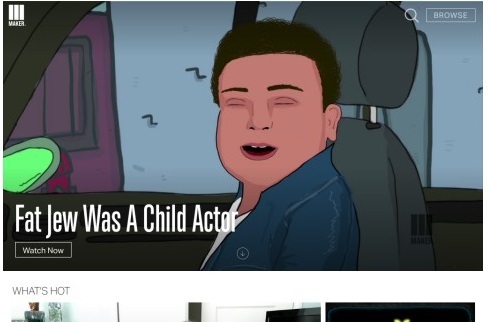 Vimeo has a major focus on the quality of the videos. Vimeo is more like a library of niche categories. You wouldn’t likely see every video that you would normally find on YouTube. You can find various documentaries and music videos with impeccable quality. Everything on Vimeo is about the quality of videos. The player with Vimeo is also better organized and lets you focus on watching the video. The distraction is minimal. You can even create your account on Vimeo. The best part that users will be bowled over is the fact that Vimeo is completely ad-free. So don’t worry about body lotions advertisements suddenly popping out when you are in the middle of an intriguing documentary. There is a paid account and a free account. The catch? The free account will have restriction on the size of the videos that you can upload. The per-week limit is 500 MB. So, you have to be careful with this limit, the number of videos doesn’t really matter as long as you comply with the limit. Obviously, the paid account wouldn’t impose such restrictions. You can upload up to 5 GB. But you will have to shell out $9.95 per month. For all those who are still unhappy with the limit, they can subscribe for an annual plan of $199. The video limit per week will be 20 GB. It sounds a great deal for people who are quite serious about video-making as a profession. Metacafe is somewhat similar in appearance to YouTube, but you will not see too much clutter. You will be surprised to know that Metacafe has been in the market even before YouTube. That’s a piece of news! When you land on the homepage, you will find a range of categories. You can even see the videos that are going popular now on Metacafe or the ones that are viral. Users can find some good quality of videos on the website. With the videos, you are most likely to see advertisements on Metacafe. If you pick any category, you will relevant videos available, maybe like today’s top five popular videos etc. If you throw a glance to your right, you will find recommended channels to browse. There is even a search bar to find videos on the Metacafe, So far so good. You will start browsing with one video and end up on some other videos, because the engagement is high. It will keep showing you relevant entertaining stuff, so that you are engrossed in the video-viewing experience. This is the reason why it gets over millions of views every day. With around 70 million subscribers worldwide, Netflix leads the video streaming service industry. You can subscribe to the rental streaming service to enjoy your favorite movies, TV shows and videos just for $9.99 per month. It provides the users with a wide range of episodes and titles that are added on a regular basis. Netflix makes your time even more enjoyable with the easily accessible platform services. You can enjoy your favorite shows and movies on Smart TV, Laptops, Gaming consoles, Home Theatre systems and even on mobile phones with the help of Netflix app from Google store or Windows store, unlike YouTube which lets you stream videos on few platforms. 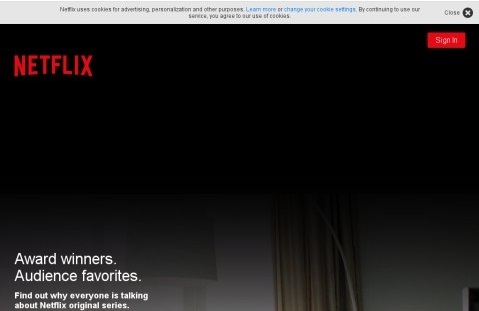 Netflix provides you with the flexibility to watch videos on multiple devices, meaning you can switch devices that is from gaming consoles to TV, also to mobile phones, and resume watching again right from where you paused. Recently, Netflix has made a tie-up with Virgin America airlines. It provide its subscribers a free Wi-Fi access in the Virgin America aircraft, and helps them stream their favorite movies and TV shows high in the sky. Blip, now known as Maker is another great video library online. Blip is majorly known to host videos series. You can really find some good stuff on Maker. When you land on the webpage, you will find a pool of recent videos added to the popular series on Maker. If you happened to notice that as soon as you play any video with Maker, other noise is cut-off. So, you are better focusing on the video. The videos are very organized, so you will probably keep on seeing relevant stuff when you finish playing one video. The range of categories available is awesome, and you will be certainly impressed by the quality of the videos. People usually upload videos in series and make a good deal of money, if the videos are viewed on the platform. You need an account to add videos, and if you want to raise the limit, then you need to subscribe. The interface is quite cool. You can organize and schedule your next videos using your account. You will even get numbers for the hits that your video has generated. If accessibility and public-reach is your concern, the Maker will take care of that too, as the videos may also be found on YouTube. So, a wider audience will probably have an access to your video. If you make some great videos, the Maker is certainly a great platform to try. 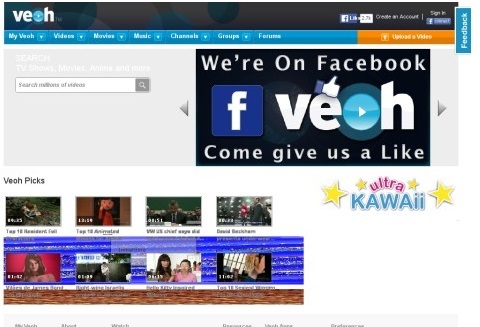 Veoh is another great platform to upload videos and view videos. If you have ever used Veoh, you will notice that it doesn’t have any limit of file size while uploading. Sounds great? Veoh has undergone changes since its inception. This is the exact reason why the platform is liked by various people who are into filming. You will be able to see many films and documentaries on Veoh. For people who are bugged by the file size on other platforms, this comes as a savior to them. Veoh will also showcase some good content videos. Another feature that is liked by the users is the easy interface. You will find various categories to browse through. You will also have a provision to receive messages on your account. If you happen to be a regular user, you can make an account and also save things that you like, the interest section will have the categories that you have marked. You need a flash player to run the videos. You can connect with your Facebook account with Veoh. So, the platform is designed to be very interactive. You can join various groups and share a lot of stuff on Veoh. Users can find a search bar to search videos. You will find good coverage of all categories. But if you are not sure what to watch, and looking to kill time on the platform, then you may not know where to head. You will have an amazing experience on Veoh if you know what exactly you are looking for, and even better if you know where to look for. You can also have a premium account. But why would anyone upgrade to a premium account? Because there’s a limit for the basic version, you can only upload two 90-seconds video in a month. The size of the video has to be less than 150MB. And for high-definition videos, the basic account will not suffice. The premium account will let you add many videos, but the videos cannot be more than 90 seconds. Is there any other advantage? Yes, you can watch the videos without any advertisements. The storage capacity is unlimited for the premium account, with the basic account it is 1TB. Flickr has a large user base who shares images, and adding videos is more like an interactive tool incorporated. So users are likely to spend more time on Flickr with video feature added to it. The time-constraint with Flickr may be a drawback, but they are actually keeping the video precise. It is fun to see people bringing out their message in such a short time. The other advantage is people will cut other irrelevant things out of the video. 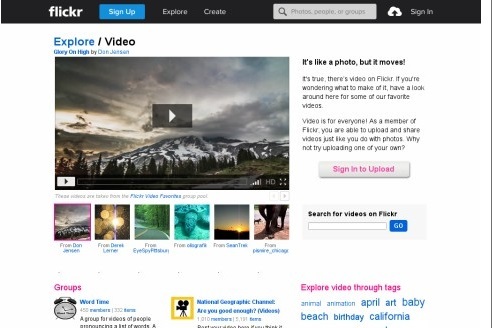 Flickr is creating a space in the video-viewing domain, and can be treated as one of the best contenders to YouTube. ZippCast is a video-streaming website. You can even create an account and upload the videos. The size limit for the video file is 2GB. You can rate the videos, and get ratings on your videos too in return. You can compile your own playlist on ZippCast. If you are extra enthusiastic about interacting with other people, then you are free to join forums that are available. There is a comment section available, so you can go ahead and express yourself. The interface was quite okay, and I expected the website to be more responsive. The website has a range of categories on the left of the screen. You can pick any category and start. There is search bar that will let you find video on the platform. As I landed on the page, I could see a lot of cartoons and animated videos, maybe users browse videos for cartoons on ZippCast. The experience is okay-okay types. If you have a liking for animation stuff, then it is certainly made for you. There are dedicated channels available for specific types of videos. Vevo is formed by four majors, Universal Music Group, Sony Music Entertainment, Google and Abu Dhabi Media. You would have observed that all these associations deal with music. So don’t be surprised by the fact that there will be music videos majorly on Vevo. But you will not find Vevo for all the countries (available in around 10-15 countries). You need to check the list;. But, you can find a dedicated channel on YouTube for Vevo, so you are not losing out on videos, but you will have to bear with YouTube Interface. If you happen to be a great admirer of music videos, then this will make you feel like a heaven. Interestingly, Vevo holds a record for the maximum hits for a music video within 24 hours of the release of the video. This video is a recent video by Adele, called as “Hello.” The video reportedly numbered 27 million hits. Vevo has other such records to its kitty, this shows the fan base Vevo has. You will find most of the music videos on the forum because they have partnered with many agencies, and Vevo happens to be an exclusive partner. So you are likely to find music videos that are latest on the Vevo, and it will be the first platform to host those. Vevo is popular for the same reason and happens to be a competitor to YouTube. Most of us know yfrog as a platform that allows the user to share images. But, this platform also allows users to share videos. It cannot be seen as a great contender to YouTube, but it is certainly a decent alternative to YouTube. But you need to take care of the video length; they have to be really short in length to be posted on Twitter. I clicked yfrog only to find that it redirects to ImageShack. ImageShack owns yfrog, which can let users to share photos and videos with their Twitter account. You can log in with your Facebook account. Yfrog is a great platform to link your social media accounts and make you videos popular. Microsoft Movies & TV, earlier known as Xbox Video, is Microsoft’s digital video service offering users with wide range of full HD movies and TV shows. A unique quality of Movies & TV platform is that you have the flexibility to watch videos over your Windows 8 or Windows 10 desktop or may be on Xbox gaming console. This platform also gives you the freedom to download the videos and watch them offline or on your PC’s or Windows mobile phones or even Tablets. To use this excellent video streaming service from Microsoft, all you need is a Microsoft or Skype account and you are good to go. The users can shop, rent, buy or just browse through their favorite videos through the Windows Store app or Xbox store. You can browse through various categories consisting of different genres like action, adventure, and animation with top studios like 21 century Fox, Disney and much more. Movies & TV service offers its users two options to enjoy the available videos. Either you can buy them or just rent them for a time period. If you buy a video, then you have the option to download it on a compatible Windows platform and watch it anytime you want to. If you go for the rental option then there is a window of 14 days or 48 hours within which you will need to watch and enjoy the videos of your choice. Movies & TV promises users of best video experience, unlike any other video service platform. With this newly updated service from Microsoft, be ready for a truly enjoyable and thrilling experience, as you get to watch all the latest movies, TV shows and videos in High Definition mode. Do you want to watch the latest episodes from your favorite TV series or want to instantly access and share your favorite videos with your friends? All has been covered with the popular video streaming service, Hulu. This platform lets you choose from popular current TV shows like The Voice, The Daily Show and much more. You also get to watch movie trailers, special episodes from different networks like Fox, The CW and Comedy Central to name a few with Hulu original classics. Hulu provides you the option of watching break free videos with the help of its excellent schemes. There are two monthly plans to select from, which are Limited Commercials and No Commercials. This feature from Hulu distinguishes the service platform from its competitors. You can watch the latest episodes and full seasons of TV show on Hulu, ad-free under the No commercials plan for just a minimal fee of $11.99 per month. The other plan comes with few commercials for $ 7.99 per month charges. Hulu also provides you with the flexibility to stream videos on your Android mobile phones, laptops, smart TV or tablets. You can also enjoy your favorite videos on different gaming consoles like Xbox One, PlayStation 3 and PlayStation 4. Viddler is another platform available online to view, share and upload videos. Videos that you will find on Viddler will be kind of informational. You are unlikely to find any videos that are related to entertainment. The main focus of Viddler is to project itself as a platform that can enable learning through informational and interactive videos. If you are running an enterprise and want to impart learning or training to employees through videos, Viddler is the best tool that you have got. Most often used by organizations for training, presentations, marketing videos and advertisements. You are most likely to fall in love with Viddler, if you want to use it for business purpose. You will get great functionalities that will help you to design better and organize your videos. There are a variety of subscription packages that are available, you can choose the one that suits your requirement and budget. The features will change according to the subscription. You can even get analytics for all the videos that you have uploaded. Viddler is a great option if it’s an organization with a decent budget. But if you are an individual looking for some platform to host your videos, then Viddler will be a bad option.